House-made beers, pub food, pizzas and steaks for hungry diners. : JT Schmid’s is one of Anaheim's most popular brewhouses, as its location nearby Angel Stadium and the Honda Center attracts many pre- and post-game diners, as well as those looking for nicely executed American comfort fare. 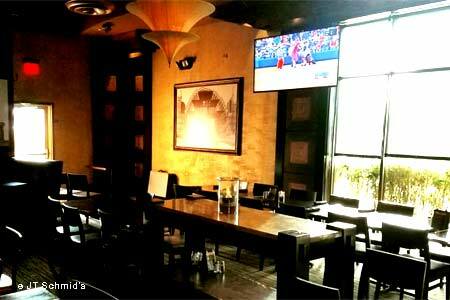 This is a casual, family-friendly place that’s ideal for hanging out to catch the game on widescreen TVs. First off, be sure to sit down and order up the in-house brewmaster’s latest potent creation. The California-style menu offers elevated pub grub ranging from salads, pizzas and gourmet burgers to steaks, ribs and chicken. A lively lunch crowd gathers for hearty soups, sandwiches and refreshing salads. Don't feel like a brew? Order up a glass of wine or a classic cocktail like a cosmopolitan or a martini. Also located at the District at Tustin Legacy, 2415 Park Ave., Tustin, 714-258-0333.